Post Sponsored by PinkBlush. All Thoughts and Opinions Are My Own. I am ready for sunshine and spring. The Spring fashion season is one of my favorites and I am loving this dress from trendy online boutique PinkBlush. I love to rock a good maxi dress or skirt in the spring time. PinkBlush has the prettiest selection of floral maxi dresses right now. What I love about PinkBlush is that PinkBlush has a line of clothes for every woman. I wore quite a few of the PinkBlush maternity items when I was pregnant with James. PinkBlush also carries a maternity plus line, items for baby, and a swimwear line. This maxi dress was so light and comfortable. The material was soft and stretchy. Now that James is walking.. which I know is crazy.. it was so easy to chase after him, but still look chic and stylish. Head to my Instagram Saturday, March 4th to find out the details on how you could win a $50 gift card to PinkBlush. Giveaway will end Tuesday, March 7th at 11:59 PM. Open to US residents only. You are not eligible to win if you have won a PinkBlush giveaway within the last six (6) months. Pink Blush is my favorite! That dress is gorgeous on you. Cannot wait for the giveaway! I love Pink Blush!! Their clothes are so comfortable & pretty. That dress looks pretty on you. Perfect for the spring! Pink Blush is one of my favorite shops! Their wrap dresses are everything! 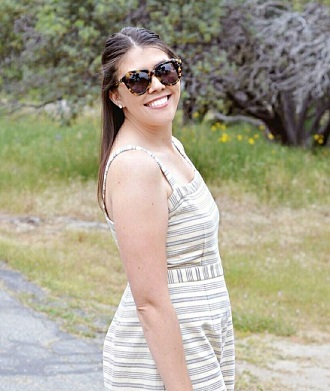 I just love PinkBlush, I really love that their maxi dresses are actually long enough on me! Usually maxi dresses are too short on me since I’m tall. And they’re SO comfortable! This dress looks amazing on you, I love the floral print.